Friday June 13th 1884. Mother and Rob went to the valley to visit at Aunt Libs today and took Hatt with them. I was busy about the work a good part of the day and worked on Hatts shawl what spare time I had. 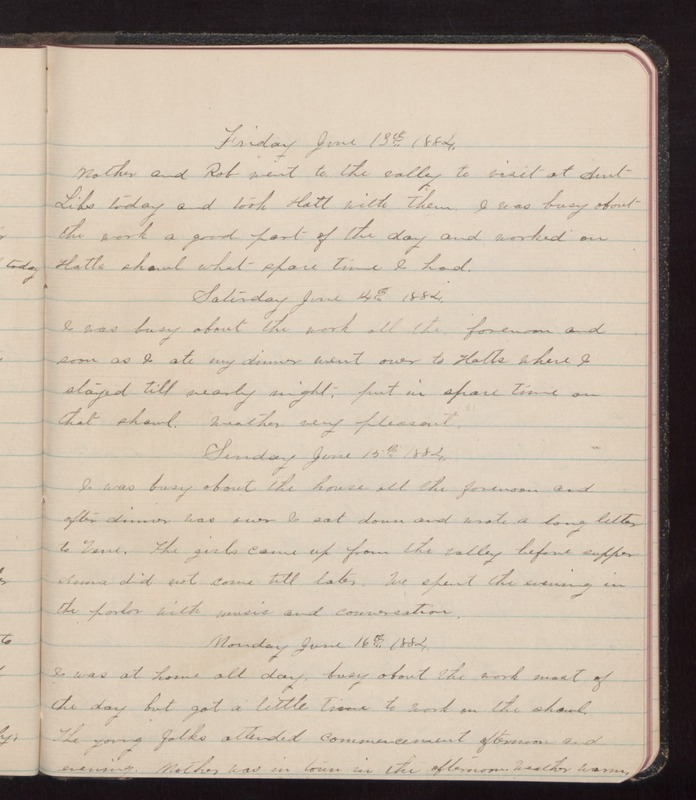 Saturday June 4th 1884 I was busy about the work all the forenoon and soon as I ate my dinner went over to Hatts where I stayed till nearly night, put in spare time on that shawl. Weather very pleasant. Sunday June 15th 1884. I was busy about the house all the forenoon and after dinner was over I sat down and wrote a long letter to Vene. The girls came up from the valley before supper Anna did not come till later. We spent the evening in the parlor with music and conversation. Monday June 16th 1884. I was at home all day busy about the work most of the day but got a little time to work on the shawl. The young folks attended commencement afternoon and evening. Mother was in town in the afternoon. Weather warmer.